I feel I should say before writing this review that I am not a movie snob. I can enjoy a stupid monster movie just as much as the next girl. In fact, I recently defended The Great Wall as just that kind of film. However, the thing about The Great Wall is it was visually inventive and consistent, which kept me entertained throughout. I went into Kong Skull Island expecting a similar experience and left feeling disappointed. Kong Skull Island has positives but in the end I don’t think it is successful. This version of Kong is set in the 1970s which was pretty creative, but like everything these days it is meant to fit into a cinematic universe with Godzilla and other famous monsters. 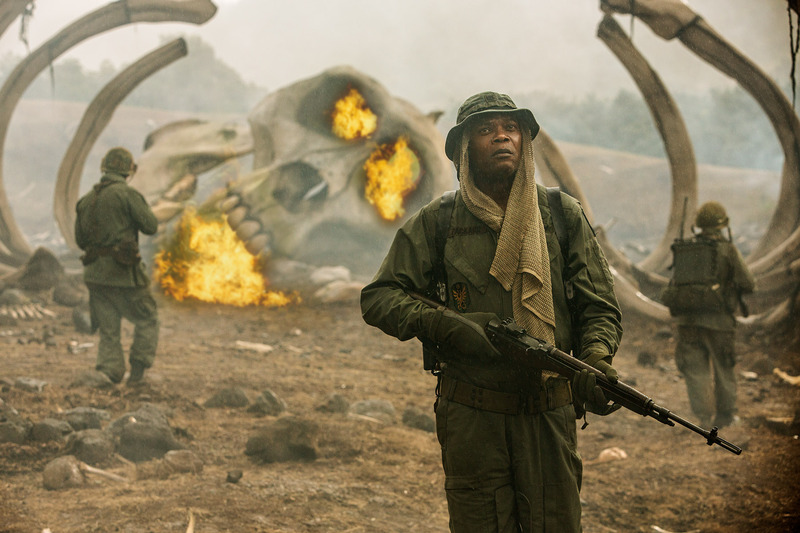 The conceit is the Vietnam War is ending and John Goodman’s character named Bill gathers a group of soldiers, trackers, scientists and a photographer to explore Skull Island. Once they arrive they face the giant ape King Kong and a variety of other creatures as well as meet a man marooned there in 1944 played by John C Reily. The special effects with Kong are first-rate and very entertaining. The problem is these special effects are not consistent throughout the movie. The 1933 film, hokey as it may now seem, had a consistent look to all the creature designs. 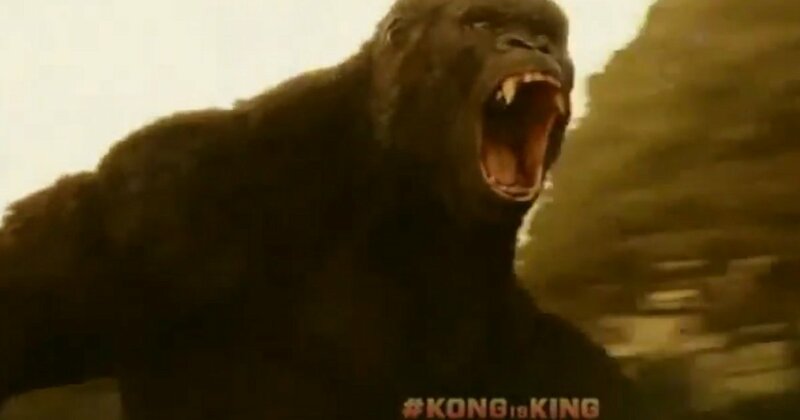 In this film there are these lizard creatures that Kong fights which I thought looked really bad. They seemed like something out of a movie from the early 2000s not 2017. This was a real problem because there are multiple scenes with just the lizards including one with some of the most ridiculous slow motion I’ve seen in a long time. The writing was also pretty inconsistent. Again, I don’t expect great writing in a film like this but it needs to be consistent. Many of the characters felt like they were in different movies, seeing different realities. Tom Hiddleston is bland as the tracker who one moment leaves a boat and yet needs his super duper tracking skills to find the river? Brie Larson is there as a photographer but her relationship with Kong feels so tagged on and underdeveloped. In the 1933 version Ann Darrow and Kong have a relationship that develops over time leading to Kong being encaged and put on display. It makes sense he would feel for her. Not here. The real victim to underwritten characters is Samuel L Jackson’s Lieutenant Packard. He basically acts like an insane man from another movie. His actions make no sense for an army man (or sane human for that matter) and all of the sudden the movie becomes a revenge piece that doesn’t work at all. They even repeat his iconic line from Jurassic Park, which I thought was a very odd choice. A character I did like was John C. Reily’s marooned 1944’s soldier. He was consistently written throughout the film. His choices made sense and he was entertaining in the way you want a B movie performance to be. Along with Kong, he was my favorite thing in the movie. Even Kong is underwritten in this film. In the 1933 film you see him grow as a character. He has emotion and heart as he is hunted and then chained to show off to the crowd. Here they try to get some of that emotion but it doesn’t work and his choices towards the end don’t make any sense. It became a bunch of lizard battles when what I wanted was a Kong movie. The soundtrack was really good! Full of 70s hits, so there’s that but I was disappointed by Kong Skull Island. There are moments of fun but it just wasn’t consistent enough for me to endorse. < 2017 Animated Oscars: Did the Right Film Win? I’m not a huge King Kong fanatic, so I’m hoping that I’ll like this film well enough. Do they show it in 3D? After watching Doctor Strange, I felt like that was a movie best seen in 3D! I just came back from seeing it, and while I agree with a lot of the points you raised I was still entertained by it. It’s essentially a glorified B-movie (like you said The Great Wall was) and never takes itself seriously like the previous Kong iterations. Which may be it’s downfall or the thing that makes it unique, depending on who you ask. Still, for me the second best Kong film is still the Peter Jackson film. That film is at least an hour too long and suffers from a weak romantic angle, but the stuff he got right (as far as the Kong mythology goes) he got really right, and it was a clear passion project for him. I won’t bother to defend the film because it’s just silly popcorn entertainment. With that said, I enjoyed it. It didn’t disappoint me, although I suppose I wasn’t expecting great art so perhaps my requirements weren’t very high. One thing I will offer however is that this is supposed to be an “original” (read different) story. Comparing the character of Ann Darrow with Brie Larsen’s Mason Weaver isn’t equivalent because they’re different people. They’re both women, but that’s where the similarities end. There was essentially no relationship between the two of them at all. Visually, however, there are lots of movies that this is referencing, from (of course) Apocalypse Now to late-’60s action thrillers to even ’70s political thrillers (the few scenes at the White House). But… yeah. 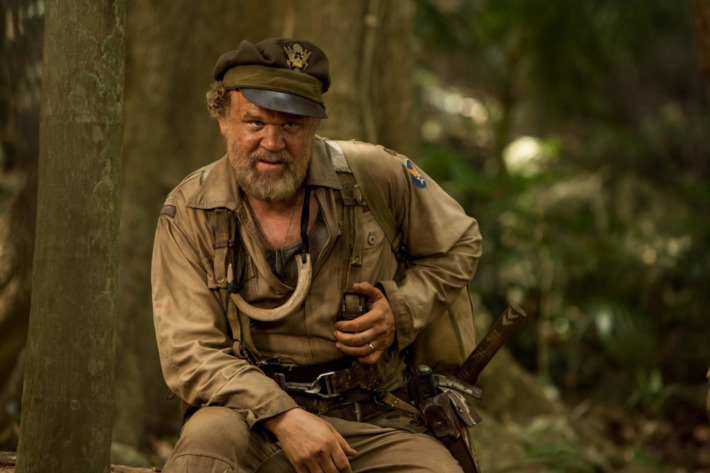 Actually, story-wise, John C. Reilly’s character did remind me of a movie trope 🙂 He has a parallel in just about every horror movie: the experienced survivor who knows everything there is to know about the dangerous situation. I love that character! Yeah that was more of an homage where I felt repeating a famous line was a strange choice. But that’s a small flaw. It was more consistency. I felt the creatures weren’t consistently rendered and the human characters all felt like they were in different movies. Pingback: Rampage Review – Reviewing All 56 Disney Animated Films And More!